I saved all of my college design projects. The closet in my old bedroom at my parents’ house is filled with them. And during a recent visit, I found a particularly interesting one. This is the project – A toy, made of paper, with the design dependent on the qualities of paper. 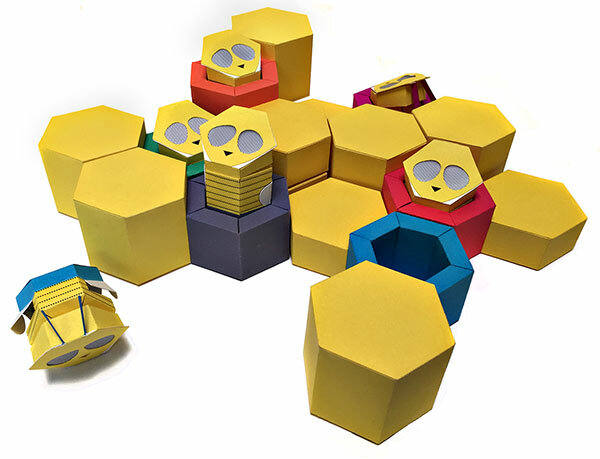 My solution was a set of bee finger puppets and their stackable hives. I was in design school during the Mac-less days, so in order to develop a prototype, we had to comp everything by hand. It’s fascinating to look at it now and remember the tedious process of creating them. The idea grew from many sketches. I drew the patterns by hand – with a rapidograph and straight edge. Then I photocopied the patterns, adhered them to Bristol Board, and cut them out with an x-acto knife. I used markers to color the Bristol Board, masking areas that I wanted to remain white. Finally, I used Letraset patterns to create the stripes and eyes on the bees, and glued them all together with rubber cement. 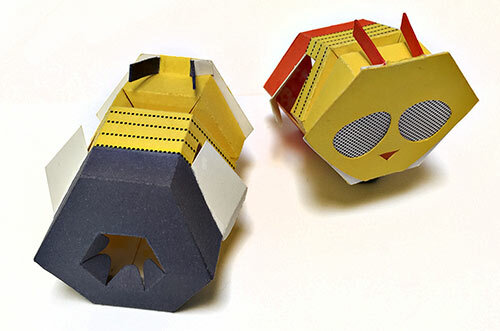 Paper bees made with Bristol Board, markers, and rubber cement. Oh, what we used to do to bring an idea to life. Admittedly, there were some drawbacks to hand comping a design. It took much longer to create, and if your comping skills were not good, the idea could get lost. It was very difficult to create complex graphics, so we often avoided them. Simple colors, geometric shapes, minimal graphics. But the process of hand comping also brought a lot of benefits. Since we had to have longer timelines, we had more time to think about the design. The focus was more on concept and less on effect because our comping tools were limited. There was a beauty in the simplicity and thoughtfulness of the solutions. There was more emphasis on printing techniques and paper to add interest. It does seem true that we’ve lost something in the creation/execution process of a project which used to also be a time to innovate and create more- not just finalize projects. Digital tools are more about getting the final result than exploration and it’s hard to argue that while these have accelerated some innovations, they’ve also cut out this essential grey zone that use to be between start to finish. Most of the time now, the only time to really innovate and change direction on complex projects seems more at the concept/boarding stage, and I miss when it was a part of the whole process more.